Born in 1898 in Armenia, Alexander Sarokhan fled to Egypt in 1924. He met Muhammad Al-Tab’ai who gave him the chance of a lifetime. Sarokhan worked as a cartoonist in "Rose Al-Youssef" magazine. He created the character of Al-Masri Effendi which was his passport to success. When Al-Tab’ai left "Rose Al-Youssef" to "Akhbar Al-Youm" newspaper, Sarokhan followed. His cartoons were also published in several magazines such as "Al-Mustaqbal" (The Future), "Automobile", "The Sphinx", "Al-Kashkul" (The Album), "Sada Al-Sharq" (Echo of the East), "Al-Sarkha" (The Clamor) and "Al-Watania" (Patriotism). The 1952 Revolution was a turning point in his artistic career. 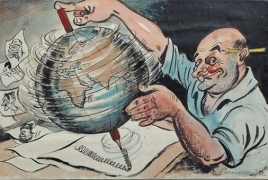 Before the revolution, Sarokhan’s cartoons highlighted party maneuvers, corruption, and parties’ conflict with the British occupation over power. After it, Sarokhan’s main cartoon character became an optimistic belle symbolizing Egypt. Egypt has been always a safe refuge for many artists, writers, who fled injustice and persecution at home to the warm hospitality and tolerance in Egypt. Alexander Saroukhan was a talented cartoonist who emigrated from his homeland; Armenia, and later settled in Egypt, where he ended up as a pioneer of political cartooning. Born in Battom, Armenia in 1898, Alexander Saroukhan received his elementary education at Russian schools, then immigrated with his family to Turkey then to Athens and Vienna, where he graduated from the School of Fine Arts. In 1924 he settled in Egypt, where he founded together with Abdel Qader Al-Shinnawi "The Pictorial Newspaper", which published only two issues. A year later, he worked as a drawing teacher at the Armenian School at Bullaq, Cairo. He became famous within the Armenian community as a cartoonist. Saroukhan was influenced by British Lowe and Cummings, American, Morris and Russian Yulmov. He mastered seven languages: English, French, Russian, German, Arabic and Turkish, besides his mother tongue; Armenian. Saroukhan worked for almost all Egyptian newspapers, including Rose El-Youssef, Al-Akhbar, Akher Sa'ah, Al-Gomhouria and Le Progress Egyptien. He was granted Egyptian nationality on October 20, 1954. On October 27, 1966, he won the American Middle East Broadcasting Corporation Silver Medal in its contest entitled "Cartoons in the Service of Peace". In 1968, he held an exhibition for his cartoons over 25 years of his life in Egypt. In 1975, Egyptian cartoonists celebrated the 50th anniversary of his life in Egypt. In 1985, his family published an album of his cartoons. An exhibition of late Egyptian-Armenian cartoonist Alexander Saroukhan’s works titled “Echoes of Past Visions” will open at Al Masar Gallery in Zamalek, Cairo on January 10, 2018 through February 19, 2018, Egypt Today says. This is the second edition in a series of exhibitions on Saroukhan’s legacy. The previous was called “Political Comedy”, which showcased dozens of examples of the artist’s work done between 1930 and 1970. “Echoes of Past Visions” will collect 35 original drawings of the artist that primarily relate to Egypt’s internal and foreign policies, along with comments on world events from nearly 50 years ago that are still relevant today, such as the Jerusalem conflict. Born on October 1, 1898 in an Armenian town under the Russian Empire, Saroukhan is considered to be one of Egypt’s first cartoonists, helping to pioneer the art form as a type of important political commentary within the region. He moved with his family to Turkey’s capital of Istanbul in 1909, Saroukhan created a small newspaper with his brother – his first foray into his future career. Upon going to study at the College of the Mekhitarists with his brother, the Armenian Genocide in 1915 forced them to stay after graduating. After his parents died, the only thing left was his art. Saroukhan focused on drawing until the end of the war, where he worked as a translator for the British Army until 1921. He then went on to study art in Vienna, before moving to Egypt in 1924, after he already had over 100 completed artworks published. His cartoons described the political atmosphere leading up to Egypt’s eventual independence in 1953 and were harshly critical of colonial rule.